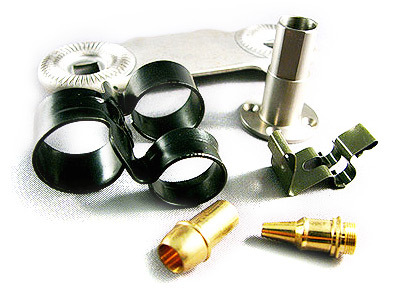 Metal Stamping, EMI Clips Gasket, Automobile Metal Stamping, Finger Stock, Electronic Metal Stamping - Ajato Co., Ltd.
AJATO is a professional supplier of metal stamping, metal pressing, metal forming, EMI clip, EMI shielding, metal assemblies, precision electronic parts, metal fabrication, terminal, hinge, spring, PCB copper stud, baskets for speaker, bracket, crew, nuts, die work, prototype. AJATO is one of the subsidiaries of the Huang - Yih Group, headquartered in Taipei, Taiwan. The Huang - Yih Group has several factories in Taiwan. We are one of the leading providers of metal pressing. We are currently the supplier for several international corporations. To continue to meet the demands and standards of our clients, we are continuously seeking innovative improvement to our operation so we can offer outstanding service and quality product to our customers. Our excellent quality stems from an all - out cooperation of our engineers, who are all trained with the latest technology to achieve our relentless pursuit to produce high quality merchandise for our customers. We strive to be the most dependable and innovative supplier in the stamping field through our continual investment in our first - class research and development centers. With a group of dedicated employees who are committed to quality and able to overcome challenges, we are confident that we will deliver nothing but the best to your business need. Our current clientele are extensive throughout the parts industry for automobile, motorcycle, mobile phones / PDA, computers / laptop / desktop speaker / stereo, case and frame, battery box case, medical, mini hard - disc case, penny motor / mini motor case, aerospace / military, hardware, stationery, tooling / mold, injection...etc. We have a continual working relationship with companies like computer field: Asus, Acer, Quanta, Compal. Cell phone field: HTC, Liteon, Ben Q. Assemble factory: Foxconn, Flextronics, Wistron, Quanta...etc.